In the June 09 issue of Macworld on page 82 under Mac 911, you described how to extract audio from a movie in iMovie. I followed your instructions and it worked very well. I then imported the audio into Soundtrack to enhance it—that worked well also—now I would like to import that enhanced version back into the movie to replace the original sound. Is there a way to accomplish this and have it synchronize with the movie? For those who find it too much trouble to click the link above to discover how to extract audio from an iMovie ’09 movie, the gist is that you choose Share -> Export Using QuickTime, and choose the option to export QuickTime to AIFF. When the file is to your liking, save it to the Desktop. 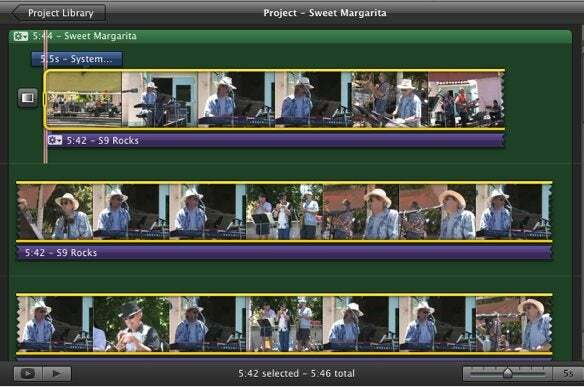 Open your iMovie ’09 project and drag the saved audio file from the Desktop to the beginning of the project in the Edit Project pane. That project pane should turn green and the name of your audio should appear in white at the very top of the Edit Project pane. Click the video track, choose Edit -> Mute Track, and play the video. You’ve muted the video’s original audio track and now hear just the enhanced track you added. Everything should be in sync. You can leave things just as they are or, if you like, you can delete the original audio track. To do so choose Edit -> Detach Audio. The video’s soundtrack will appear as a purple bar beneath the video track. Click on that purple bar and press the Delete key. You’ve now left with just the audio track that you “sweetened” with an audio editor. New audio track added and original audio detached.